New Delhi: Ahead of his historic visit to Israel, Indian Prime Minister Narendra Modi tells Israel Hayom that the two countries are ready to “take the relationship to a new level” • Israel “braved many odds” and has “amazing accomplishments,” he says. 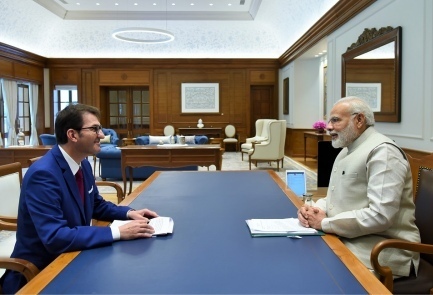 It is not every day that one meets a prime minister representing 1.2 billion people, one considered a superstar at home and abroad. Maybe that is why the meeting with Indian Prime Minister Narendra Modi felt so special. Modi is set to arrive in Israel on Wednesday for what will be a historic visit: the first to this country by a sitting Indian prime minister. Despite the disparity in the sizes of the two countries, the relationship between them is one of equals, as far as he is concerned. Modi is a different kind of leader. With sky-high popularity among Indians, he can say what he wants and push for the reforms he seeks. He has tried to move India forward and make it a global leader. For him, the path to achieving those goals passes through Israel. This should be a badge of honor for all Israelis. He knows Indians love him, but he also knows that he must not fail. That is his big challenge. When I arrive at Modi’s official residence, I discover that the man who always looks tough in front of the cameras is a friendly person who knows how to smile. He takes immense pride in his success in pulling himself up by the bootstraps after being born into poverty. Throughout the interview, he makes a conscious effort to point out the deep ties between the Indian and Israeli peoples. He believes the two nations are soulmates. They share a spirit of entrepreneurship and innovation that gives the partnership its own dimension. He and his people have also gone out of their way to tap into this sentiment by organizing a rally for the local Indian community in Tel Aviv on July 5, to be led by Modi himself. He considers this a very important part of his trip, his way of showing his respect to the local Indian community. Q. What do you know about Israel? Have you ever visited Israel? “I got firsthand experience of Israel during my visit to Israel in 2006, as chief minister of the Indian State of Gujarat, to take part in an Agritech exhibition. I am happy to return after more than a decade, and I look forward to seeing the developments and advances Israel has made in this time. Q. Why have you made a decision to go ahead with this historic visit? “Bilateral ties between our countries have always been strong. In fact, over the years, they have been continuously expanding and diversifying. In the recent past, the steady strengthening of our ties has begun finding reflection and reinforcement in high-level visits. You would have noticed that the frequency of exchanges has gone up over the last three years. No Indian president or prime minister had visited Israel before our president visited in 2015. President Reuven Rivlin’s visit to India in 2016 was only the second Israeli presidential visit to India. Q. Does this decision imply a more pro-Israel posture in the U.N.? Q. Does India still consider itself unaligned with either the West or the East? “We believe in the philosophy of ‘Vasudhaiva Kutumbakam,’ which means ‘the world is one family.’ We want to engage constructively with both the East and the West. Q. Are Israel and India facing the same threat of terrorism? Q. Is this a reset or an upgrade of relations? Q. Will you agree to visit Jerusalem and the Western Wall like President Donald Trump? Q. What is your position on the question of sovereignty in Jerusalem? Will India move its embassy? Q. Your biography, as a man who grew up in poverty and climbed up the ladder with hard work to become the country’s head of government, is impressive by any measure. But despite your past, you are an ardent supporter of the capitalist system and want to liberalize the economy. Can you explain what shaped your worldview? Q. You have tried to reform Indian society, in part by the use of modern technology in remote and rural communities that lack proper sanitary conditions. Can Israel play a role in this? Q. What is the difference between the approach Israelis and Indians have when it comes to business, agriculture and other fields? “As societies, India and Israel are both driven by a strong entrepreneurial mindset. Business cultures in the two countries are unique and have evolved from their respective context in which each has evolved. There may be differences in their approach but the Indian and Israeli businessmen whom I know have told me that both have similar scientific temperament. Q. How can we describe to the average person what innovation ties are there between Israelis and Indians? “I think the average person is highly aware of our innovation ties as the outcome of our engagement touches his life. Our perspective on innovation may be varied by but we both rely on it to add wealth and value to our societies. Israelis and Indians are innovative by birth. India and Israel both support and sustain unique innovation ecosystems. Our common effort is also to link the creativity of innovation with the energy of entrepreneurship. Q. What kind of Israeli imports does India seek?